Quests are objectives given to the player that provide rewards as well as story progression. 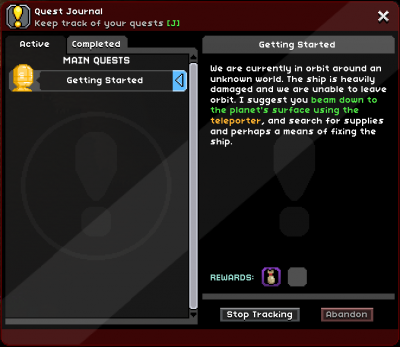 There are a number of pre-designed Quests that center around the game's main story in addition to a procedural quest system which generates smaller side quests. Most main story quests revolve around characters at the outpost, which serves as the game's main quest hub. Procedural quests can be encountered in villages, in some Microdungeons or from tenants which are summoned to structures with a colony deed. The Quest Journal is the main UI window for tracking the players Quests. It lists current quests in progress, as well as previously completed and failed quests. By selecting the quest name in the list, the details of the quest will show on the right. These details include a description of the quest objective, as well as listing rewards. When encountering a quest giver a window will popup with the details of the quests and the rewards. Clicking 'Accept' will add the quest to the player's Quest Journal while clicking 'Reject' or hitting the Escape key will exit the window without adding it to the Journal. When the objectives have been completed, the Quest Complete window will pop up allowing the player to accept or reject the quest rewards. Completed quest details are stored in the completed tab of the quest window and can be viewed there after a quest is complete. Missions are pre-built encounters that usually culminate with a boss encounter. They involve multiple quests, and allow advancement into game progression. Most missions can be visited at any time after the initial quest is received using the ship computer. One set of notable exceptions is the three arena quests offered by Nuru - the only way to access the arenas is to get Nuru to beam you to them, and these arenas become inaccessible once their quests are completed. Other notable exceptions include the optional introduction mission (cannot be revisited once completed) and The Ruin (cannot be accessed from the ship, only by using the Ark portal). Most non-hostile NPCs offer a large array of procedurally generated quests. These can involve hunting down nearby enemies, delivering gifts, gathering items and more. Different NPC types offer different types of quests. The quest difficulty (or total quest chain difficulty) determines the pool of items that Reward Bags pull from. Collecting gifts, cooking, and crafting are low difficulty, generally giving a bonus of +0.1 to a running difficulty total. Defeating NPCs and growing crops are medium difficulty, generally giving a bonus of +0.5. Killing groups of monsters, building themed homes, and capturing certain pets are high difficulty, generally giving a bonus of +1.0 (which makes these quests always give High-Value Rewards from their Reward Bags). Below is a list of quest types, sorted by NPC type. Quest types with a # at the end cannot be chosen as the last quest in a quest chain, while quest types without this symbol can be chosen as the last quest in a quest chain. Also, each quest's difficulty bonus and cost (used to calculate Reward Bag reward level) is listed in parentheses (cost is deducted on quest generation, and bonus is added on quest completion). The navigation box below lists the game's premade main story and side quests. Unlike procedural quests, most of these have prerequisite quests which must first be completed before players are eligible to receive them. Following the main story questline will require players visit a variety of planet types and explore in addition to clearing dungeons and defeating bosses. There are many methods to progressing through the games systems to become powerful enough to advance; farming, dungeon-crawling, or being a landlord will all give opportunities to progress through quests. This page was last modified on 31 December 2018, at 12:13.